Where exactly is the retreat hosted? What's unique about this location? It's a calm, safe and peaceful compound in a small village close enough to Marrakech to be able to plunge in to vibrant Moroccan life on afternoon trips to the souk, medina and hamman. There's a beautiful walled garden where children can wander safely. Our host, Linda, is a former school teacher from New Zealand who has made Morocco her home. She has put together an incredible team, amongst them an extraordinary chef, Fatima, and loving, attentive childcarers. 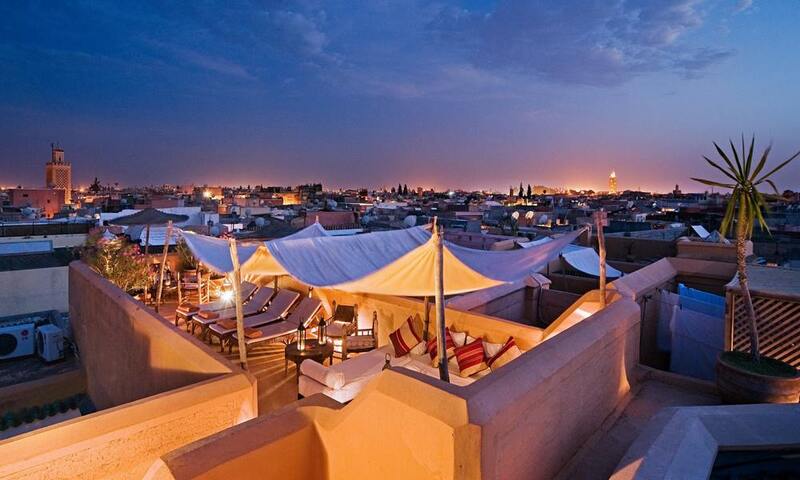 Newly converted country riad. Each room has an ensuite bathroom. Marrakech airport is a 20-30 minute drive away. What age group of children is this retreat ideal for? The childcare team are particularly good with babies and toddlers. The connection between the Moroccan childcarers and the visiting mums and children is very heart-centred and the mums always feel very safe leaving their children in their hands. Moroccans love children and it's a very child-friendly place to visit. As most tourists who visit Morocco and ex-pats who live here will confirm, the country feels safe and peaceful. The economy is stable and it is Africa's 5th largest relying on agriculture, phosphates and tourism. Morocco is also stable politically with a parlimentary constitutional monarchy, Prime Minister and multi-party system. King Mohammed VI is moderate and respected by the people. Security is well organised and there are no extremist groups or any with violent aims in the country. We believe that at this time it is even more important people travel to Moslem countries like Morocco so that we keep promoting the dialogue and understanding between cultures. How much is the retreat and what does it include? 1330 Euros including accomodation, all meals, yoga, childcare, hamman spa and massage, airport transfers and 2 excursions (shopping trip to Medina Marrakech and La Majorelle Gardens). Part of this money will go towards a project we are instigating to support local orphans. Carpets, clothes, jewellery or anything else you barter for in the market. Sally Goldfinger is a full time Yoga teacher based in Morocco and an experienced Yogi with more than 10 years of experience. Sally specialises in Ayurveda Holistic Wellness and works professionally with clients from all over the world. Sally blends in Ayurveda holistic philosophy into her daily life, her Retreats and her Yoga classes. Her energy is calm, grounding, patient and kind. Sally's teaching style is gentle with focus on stress release through movements (sun salutations), yoga poses and gentle meditation. She is able to adapt her classes to all levels, no matter age or experience and we are thrilled to have Sally teach at our Morocco retreats in 2019.